As part of the 1820 rejuvenation of Philadelphia's public squares, the city of Philadelphia renamed the northeast square after Benjamin Franklin and accepted a plan to redesign the square by William Rush and Thomas Birch. Rush and Birch depicted an orderly and picturesque view of nature by designing the park to be completely symmetrical by both walkway and plant locations. This image shows the original watercolor and ink plan that Rush and Birch created in 1824. 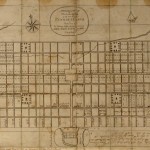 Trees and green spaces were essential to the vision that William Penn and his surveyor, Thomas Holme, laid out in their initial plan for the city of Philadelphia. 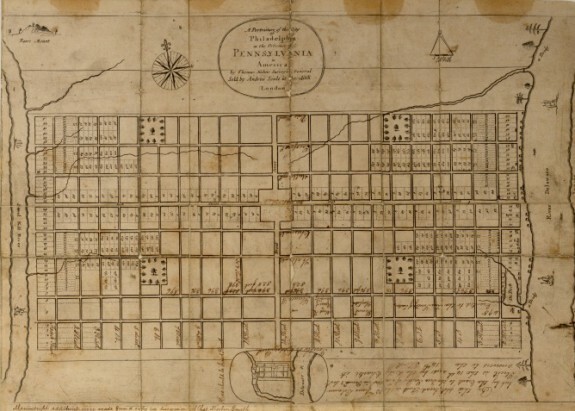 Penn envisioned Philadelphia as a "Greene Country Town," with a limited number of buildings on each block and enough land for each house to possess a garden, orchard, or field. As this map produced by Holme in 1683 shows, the plan for Philadelphia also reserved five squares specifically for public commons, which would eventually include a diverse number of trees and vegetation from the surrounding area. Penn also named the east-west streets on this map after a number of local tree varieties: Cedar (now South), Pine, Spruce, Walnut, Chestnut, Mulberry (now Arch), and Sassafras (now Race). 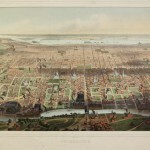 Lumber had been a primary resource for construction and energy production in Philadelphia from the time the city was established, but the requirements for more lumber as the city grew had a devastating effect on the nearby hinterland. Thousands of acres of forest were razed to supply businesses and individuals with lumber and clear space for new buildings and factories. 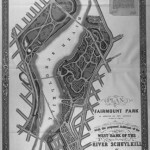 During the 1840s, the City of Philadelphia began to purchase land along the Schuylkill River to protect the city's water supply, land that eventually became Fairmount Park. The first property the city purchased was a forty-three-acre parcel owned by Robert Morris, the property to the right of the Schuylkill on this map. 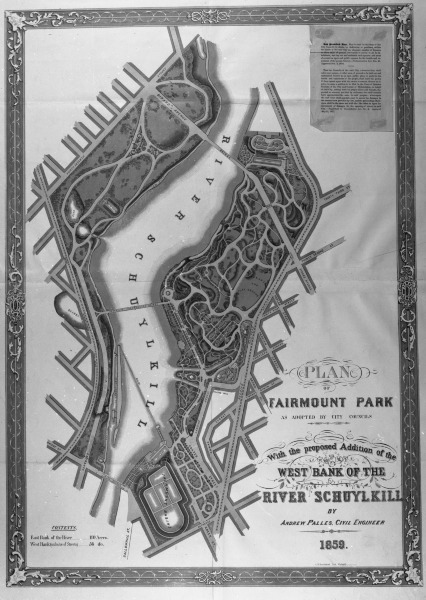 Fairmount Park was officially established in 1855, but the Fairmount Park Commission continued to expand the park to eventually include more than 4,100 acres of land. This 1859 map shows the first proposed expansions of the park to the west of the river. Before the construction of Philadelphia's city hall, the square at the intersection of Broad and Market Streets was one of the five public squares that William Penn designated in his original layout of the city. 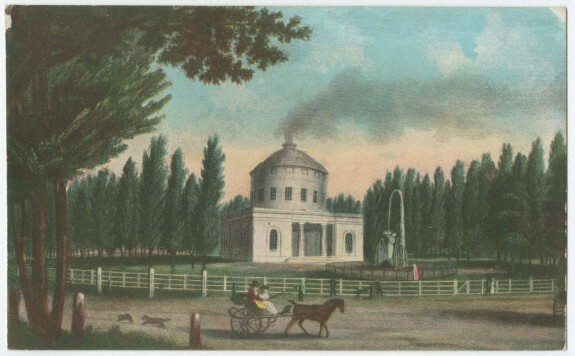 This painted postcard from the late nineteenth century depicts the "Centre Square" when it still had an engine house that powered Philadelphia's first waterworks in 1801 and featured a fountain with a wooden allegorical figure representing the Schuylkill River designed by city councilman William Rush in 1809. The tall Lombardy poplar trees that lined Centre Square were popular in early nineteenth-century America because they could be easily transplanted and grew quickly. The rejuvenation of Philadelphia's city squares in the 1820's changed more than just the look of the squares, it changed the types of activities that occurred on the squares. Pubic squares were once the site of trash dumps, potter's fields, and public hangings, but the beatification of squares removed that blight and replaced it with natural elegance that would allow people to experience and enjoy the beauty of nature. 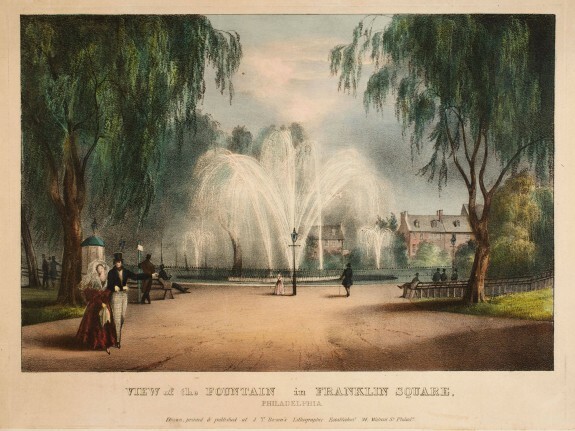 This 1839 lithograph by John T. Bowen depicts people casually walking along on of the path in front of Franklin Square's central fountain. 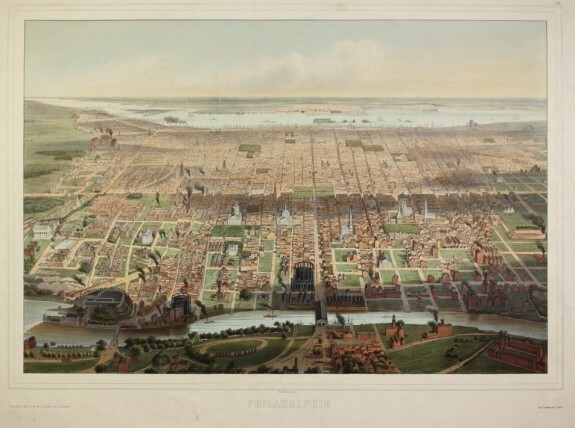 In this eastward-facing aerial view of Philadelphia produced by John Bachmann in 1857, all five public squares (Centre, Franklin, Logan, Rittenhouse, Washington) can be seen with their thick tree cover surrounded by the buildings of the growing city. In the 1850s, Philadelphia was expanding, but still had lush green fields to the north and numerous city blocks that were still undeveloped. In this view, the Schuylkill flows in the foreground and the Delaware River is in the distance. Penn Treaty Park, named for the traditional story of William Penn’s peaceful treaty with the Lenni Lenape Indians, is found at 1341 N. Delaware Avenue in Philadelphia’s Fishtown section, about 1½ miles upriver from Penn’s Landing on the Delaware River. The treaty supposedly was agreed to on land now occupied by the park. In this painting, Penn’s Treaty with the Indians by Benjamin West (1738-1820), the iconic event is depicted as West imagined it. The site of the agreement was said to be marked by the Great Elm, located to the right in the image. The original elm fell during a storm in 1810, and two hundred years later, in May 2010, a descendent elm was planted in its place. Though no first-hand evidence of the treaty exists, West and other artists have contributed to the legend through their art, and the park’s establishment helped perpetuate it as well. Trees have been culturally, environmentally, and symbolically significant to the Philadelphia region since the city’s founding. They were believed to improve public health, they beautified and refined city streets, parks, and other green spaces, and several were revered as living memorials to past historical events. Trees also faced their fair share of destruction during the nineteenth and early twentieth centuries, as unregulated agricultural clear-cutting, competitive markets for fuel and timber, growing industry, and expanding population eliminated many of the region’s forests. Beginning in the late nineteenth century and continuing into the twenty-first century, local, regional, and state organizations have collaborated to increase the tree canopy cover in the Greater Philadelphia area. 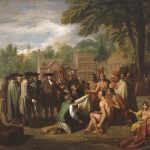 By the time Penn arrived in North America, however, Native Americans had already dramatically altered the region’s forests. The Lenni Lenape used fire to manage forests, clear land for agriculture, and burn underbrush to encourage the growth of young plants that attracted deer and other small game. Native Americans depended heavily on wood, bark, and vegetable fibers to construct houses and other material goods. When villages exhausted forests after a few decades, communities settled in new sites a few miles away and the process began all over again. By the late seventeenth century, however, European disease had decimated the native population and many of their cultivated spaces may have become overgrown. 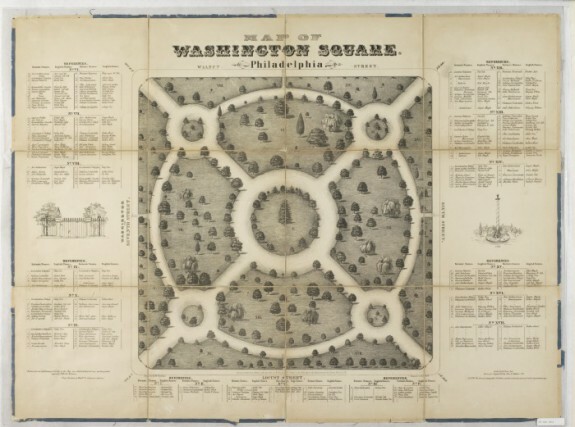 In 1683, when William Penn and surveyor Thomas Holme (1624-95) laid out Philadelphia’s streets in a symmetrical grid, they envisioned trees and green space as important components of the city plan. Penn reserved land for five public squares in different sections of the city and he intended for every house to be surrounded by gardens, orchards, or fields, “that [Philadelphia] may be a greene country town which will never be burnt and always be wholesome.” Inspired by the many types of trees that grew in the region, Penn named the east-west streets of Philadelphia after local varieties: Cedar (now South), Pine, Spruce, Walnut, Chestnut, Mulberry (now Arch), and Sassafras (now Race). 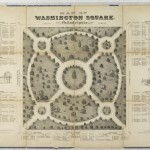 Even though most Philadelphians did not set aside large portions of their land for trees and plants as Penn envisioned, a 1796 map of Philadelphia by John Hills showed trees to be a defining feature of the city after the Revolutionary War. Trees shaded the grounds adjacent to the Pennsylvania State House (now Independence Hall), and wealthy citizens planted them in front of their homes, inspired by the tree-lined promenades of European cities like Paris and Antwerp. 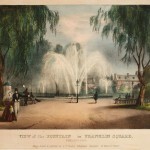 Art historian Therese O’Malley has argued that a desire to ornament the new republic motivated an increased interest in landscaping after the Revolution; city trees provided a way to project an aura of refinement and gentility. 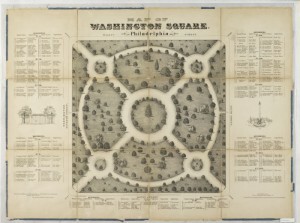 Several squares in Philadelphia became defined by their distinctive trees. 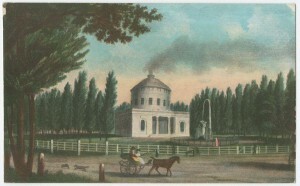 Tall Lombardy poplars lined the pathways of Centre Square, the location of a neoclassical Engine House powering the city’s first Waterworks and, later, the site of City Hall. First brought to the United States from Europe in the 1780s by William Hamilton (1745-1813), the proprietor of the Woodlands estate outside the city, Lombardy poplars became extremely popular throughout the Northeast because they quickly grew to great heights and were easily transplanted. Many American cities planted Lombardy poplars after 1799, the year of George Washington’s death, because they were believed to be the first president’s favorite tree. 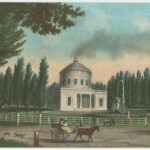 Washington Square served as an arboretum to educate the public about horticulture. By 1831, the square contained fifty varieties of North American and European trees, two of which were introduced by Meriwether Lewis and William Clark from their 1804-06 expedition in the Rocky Mountains. Select trees in the Philadelphia region were venerated as silent witnesses to a historical and environmental past in the nineteenth century. 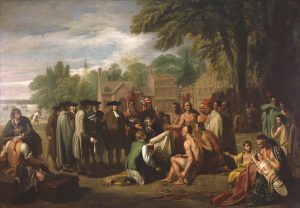 Paintings, prints, textiles, and fine china celebrated the “Treaty Elm,” under which it was believed William Penn purchased land for Philadelphia from the Lenape in 1683. Images of the respected tree referenced Philadelphia’s creation narrative while also reminding the viewer of the sylvan heritage that contributed to the region’s economic success. A blow to that hallowed heritage occurred when the elm fell in an 1810 storm. The elm’s wood was converted into various artifacts—including trinket boxes and portrait busts of Penn–disseminated throughout the nation and even across the Atlantic Ocean to England. The Treaty Elm, through its destruction, commemoration, and veneration, served as a tangible symbol of the state’s sylvan past, saturated with mythic historical meaning. While trees were cultivated in city streets and parks and revered as historical eyewitnesses, they were aggressively harvested in the region’s hinterlands from the eighteenth until the early twentieth century. Wood served as a primary resource for the region. By 1810, approximately two thousand sawmills in Pennsylvania produced nearly seventy-five million feet of sawn lumber. Philadelphia exported or utilized huge quantities of this wood in shipbuilding, housing, construction, tanning, and fuel. As a result of rapid wood consumption, timber in easy proximity to transportable waterways became scarce by the beginning of the nineteenth century. Large forests of oak, chestnut, pine, and cedar in southwestern New Jersey, directly across the Delaware River from Philadelphia, almost completely disappeared because of agricultural clear-cutting and fuel consumption. One sawmill operator reported in 1821 that the large rafts of sawn lumber floated downstream to the Delaware River wharves north of Vine Street “have decreased [and] they must more & more…the Timber in most places is nearly all cut away.” This deforestation increased by the end of the nineteenth century with the advent of the railroad logging era. Geared logging locomotives allowed the lumber industry to harvest vast, previously inaccessible, acres of forest, and advances in chemistry permitted all types of wood to be treated and distilled into acetate of lime, wood alcohol, wood tar, charcoal, and gases. By the late nineteenth century, forest education and advocacy campaigns organized by concerned citizens culminated in the establishment of forestry departments and policies at the state and national level. The French botanist François André Michaux (1770-1855)—author of the foundational treatise of American forestry, North American Sylva (1819)—left a legacy of $12,000 to the American Philosophical Society in Philadelphia to fund a lecture series in silviculture (the science-based management of forests). The resulting Michaux Forestry Lectures, presented from 1877-92, represent an early attempt to educate the general public on forestry concerns. The Pennsylvania Forest Association, founded in Philadelphia in 1886, developed from discussions of forest issues at a local women’s club. Joseph T. Rothrock (1839-1922), a professor of botany at the University of Pennsylvania and frequent Michaux Forestry lecturer, was elected the association’s first president and later became the state’s first commissioner of forestry. Over the next century, local, state, and national governments assumed responsibility for the planting, cultivation, and preservation of trees in Pennsylvania, Delaware, and New Jersey. In 1895, a Forestry Commission appointed by the Pennsylvania State Board of Agriculture reported that the amount of forested land in the state had decreased from more than ninety percent to thirty-six percent of the state’s land area, threatening timber supply, water quality, and public health. The Pennsylvania Forestry Commission began purchasing marginal or cutover land abandoned by farmers and timber industries in 1898 in order to encourage forest regrowth and the State Department of Forestry continued these activities after its establishment in 1901. New Jersey established a Forest, Park, and Reservation Commission in 1905, and Delaware introduced a State Board of Forestry in 1909 to monitor and preserve their own forests. By 1936, nearly 179 million seedlings raised in state-funded nurseries had been planted in state forests, along streets and highways, and on private land in Pennsylvania. The early twentieth century also saw the establishment of several local, publicly accessible arboretums—including Morris Arboretum of the University of Pennsylvania and Tyler Arboretum in Media—to preserve and study local trees and species from all over world. In 2011, the Pennsylvania Horticultural Society partnered with thirteen counties in southeastern Pennsylvania, New Jersey, and Delaware in a “Plant One Million” campaign to restore the tree canopy cover of the region to thirty percent, replacing trees lost to development. The Parks and Recreation Department additionally introduced the TreePhilly initiative in 2012 to provide free yard and street trees and facilitate maintenance workshops for urban communities. Tree canopy covered twenty percent of total land in Philadelphia in 2012, a four percent increase from 2008, according to a study by the University of Vermont Spatial Analysis in partnership with the United States Forest Service. Valued for their role in improving air and water quality, blocking noise pollution, providing shade, and reducing the “urban heat island effect,” trees became more and more visible within the diverse landscape of the greater Philadelphia region. DeCoster, Lester A. The Legacy of Penn’s Woods: A History of the Pennsylvania Bureau of Forestry. [Harrisburg, Pa.:] Pennsylvania Historical and Museum Commission for Dept. of Conservation and Natural Resources, Bureau of Forestry, 1995. Fergus, Charles. Trees of Pennsylvania and the Northeast. Mechanicsburg, PA: Stackpole Books, 2002. Jones, Owain, and Paul J Cloke. Tree Cultures: The Place of Trees and Trees in Their Place. New York: Berg, 2002. Judd, Richard William. The Untilled Garden: Natural History and the Spirit of Conservation in America, 1740-1840. New York: Cambridge University Press, 2009. Lawrence, Henry W. City Trees: A Historical Geography from the Renaissance Through the Nineteenth Century. Charlottesville: University of Virginia Press, 2006. Milroy, Elizabeth. “‘For the Like Uses, as the Moore-Fields’: The Politics of Penn’s Squares.” The Pennsylvania Magazine of History and Biography 130, no. 3 (July 2006): 257–282. ———. “Pro Bono Publico: Ecology, History, and the Creation of Philadelphia’s Fairmount Park System.” In Nature’s Entrepôt: Philadelphia’s Urban Sphere and Its Environmental Thresholds, edited by Brian C. Black and Michael J. Chiarappa, 35–54. University of Pittsburgh Press, 2012. ———. “Repairing the Myth and the Reality of Philadelphia’s Public Squares, 1800–1850.” Change Over Time 1, no. 1 (2011): 52–78. O’Malley, Therese. Keywords in American Landscape Design. New Haven: Yale University Press, 2010. ———. “Landscape Gardening in the Early National Period.” In Views and Visions: American Landscape Before 1830, edited by Edward J Nygren. Washington, D.C: The Corcoran Gallery of Art, 1986. Penn, William. Letter from William Penn Proprietary and Governour of Pennsylvania in America to the Committee of the Free Society of Traders of That Province, Residing in London. Containing a General Description of the Said Province, Its Soil, Air, Water, Seasons And. London: Andrew Sowle, 1683. Rhoads, Ann Fowler, and Timothy A. Block. Trees of Pennsylvania: A Complete Reference Guide. Philadelphia: University of Pennsylvania Press, 2005. Richter, Daniel K. Facing East from Indian Country: A Native History of Early America. Cambridge, Mass. : Harvard University Press, 2001. Rilling, Donna J. “Sylvan Enterprise and the Philadelphia Hinterland, 1790-1860.” Pennsylvania History 67, no. 2 (Spring 2000): 194–217. Rival, Laura M. The Social Life of Trees: Anthropological Perspectives on Tree Symbolism. New York: Berg, 1998. Samuels, Gayle Brandow. Enduring Roots: Encounters with Trees, History, and the American Landscape. New Brunswick, N.J: Rutgers University Press, 1999. Stroud, Ellen. Nature Next Door: Cities and Trees in the American Northeast. Seattle: University of Washington Press, 2012. Watson, John Fanning. Annals of Philadelphia: Being a Collection of Memoirs, Anecdotes, and Incidents of the City and Its Inhabitants, from the Days of the Pilgrim Founders . . . to Which Is Added an Appendix, Containing Olden Time Researches and Reminiscences of New York City. Philadelphia: E.L. Carey & A. Hart, 1830. Franklin Square, 200 N. Sixth Street, Philadelphia. Penn Treaty Park, 1341 N. Delaware Avenue, Philadelphia. Tyler Arboretum, 515 Painter Road, Media, Pa.
Washington Square, 210 W. Washington Square, Philadelphia. What a delightful and complete historic perspective on the role of trees throughout our region. Would have liked to see mention of the Pennsylvania Shade Tree Ordinance of 1700. This public act of the Penn family was the precursor of modern landscape codes and tree ordinances. This public act did much to fulfill the promise of a ‘greene country towne” and led to the replanting of the town following the removal of the native forests. There seems to be missing from this research and anywhere online in other resources the tree planting events from the 1970s. I took part in a cermony to plant a tree in Penn Treaty Park in 1975 as part of a 100,000 Trees Planting project, but this is not described anywhere online. I wonder why.